The Grindstone Award Foundation finished off 2018 with another great event, in partnership with the Canadian Women’s Hockey League, hosting a third skills clinic session this season. “We strive to give back to the community and are so proud to have a strong partnership with such an amazing organization,” said Chelsea Purcell, Markham Thunder general manager. Female players hit the ice with the Thunder at Thornhill Community Centre and gained insight on the game and the CWHL through off-ice sessions. Among the highlights of skating with the Thunder for the young players was getting to watch the next generation of female hockey heroes including; Victoria Bach, Laura Stacey, Jamie Lee Rattray, Jocelyne Larocque and Laura Fortino, who all recently competed with the Canadian women’s national team at the 4 Nations Cup. Proceeds from the skills clinic go back to the Grindstone Award Foundation for grants to be handed out for girls who face financial barriers that would keep them out of the game. “Hockey was my entire childhood. It’s where I met some of my best friends and learned life lessons that I’ve carried with me to this day. It’s pretty special to be part of Grindstone and being able to give that gift to someone else.” said Markham Thunder forward Jess Jones. The foundation provides grants for players across Canada under the age of 19. 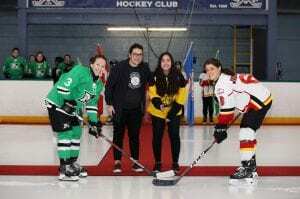 While the clinics that were held with the Calgary Inferno, Toronto Furies and Markham Thunder have been an excellent way to raise awareness about female hockey and to fundraise. “We are looking forward to continuing our partnership with Grindstone so more girls can play this amazing sport. We thank them for coming to our community, and putting on such a great event,” said Purcell. The Grindstone Award Foundation also accepts donations by mail in cheque, e-transfer, cash or credit card transactions through PayPal. All monetary donations will be provided an official tax receipt. “It’s been incredible to see our cause inspire so many across the country.” said Di Rocco. “In our infancy we are thrilled with the participation and support we’ve received from the community. We know the momentum gained will positively impact young female hockey players and allow them to continue playing our great game,” Dominique Di Rocco, general manager Grindstone Award Foundation. The Grindstone Award Foundation is a charity that enables young female players to participate and improve their skill development in the sport of hockey.